Several tiles similar to this one dot the ceiling in my classroom. Of course, I try to be a little more diplomatic than that, but really, many critics of balanced literacy are that — wrong. Everyone in the class is reading. Everyone except Rebecca. She stands in front of the book shelf I’ve labeled “Literature at Its Finest.” Between bookends on the top are paperback classics; authors ranging from Ray Bradbury to H.G. Wells. The first shelf is stacked with anthologies from my university studies in literature: Homer, Sophocles, Chaucer, Milton –the Complete Works, and more texts from the canon: The A Tale of Two Cities, Adventures of Huckleberry Finn, The Awakening, To Kill a Mockingbird. And many I have never read: 1984, Lord of the Flies, Heart of Darkness, A Farewell to Arms, Brave New World. “I want to read a romance,” she says. “So you want a romance that’s a challenge?” I say. “Yes, they make those, right?” she answers, and we both laugh. I pull Pride and Prejudice, Jane Eyre, and Wuthering Heights. I hand Rebecca each book as I talk a bit about them. Why I love Jane Austen and a little about the Regency Era, a quick bio of the Bronte sisters, and a tad about Gothic literature. A few minutes later, I see that she has the clipboard where students sign books out from our class library. Rebecca has decided to read Pride and Prejudice. A week passes. I meet with Rebecca for a conference. She tells me that this book is hard. She has to re-read parts of it for it to make sense. We talk about her strategies for comprehension. She says she is not giving up. Two weeks pass. I ask students to share out with the class what they are reading. Rebecca says P & P and smiles as she declares that she’s finally figured it out. “I get it now, and I am getting better at reading it.” When I get a chance, I walk over to her desk and ask her what she means. “The characters, everything,” she says. “It was the language that was really throwing me, but I understand the story now. I like Jane — her attitudes and opinions.” I make a note to follow up on this conversation. Critics may say: So, she’s reading Pride and Prejudice. She won’t understand the nuances, the humor, the satirical elements, or even the social commentary without guiding questions and class discussions to help her. They are right. Rebecca probably won’t get all that. But she and I are fine with it. We have learned how to look at language and deconstruct texts, analyzing as we go with short texts we read and study in class. If I asked Rebecca to select a page and analyze some aspect of Austen’s language, I know that she could do it. She is a a critical thinker and a competent writer. And she has challenged herself into a beautifully written complex piece of literature. And she likes it. I want students to love literature. I want them to become readers. The best way I know how to accomplish both is to let them choose the books they read. I surround my students with rich literature. I talk about books daily. They talk with one another about what they are reading regularly. We build a community where they know my expectations for them as readers, and they evaluate themselves — setting, reviewing, and adjusting expectations for their own reading lives often. When we model the life of a reader, students will follow our lead. Like Chris who chose this National Book Award Finalist. We are well into the school year, and more and more students have moved into more complex books, and they are thinking about their reading choices. 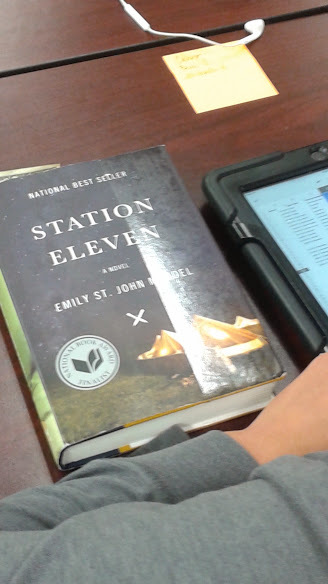 Chris: Currently reading Station Eleven. Chris asked me recently to recommend a book. He said, “I’ve liked everything you suggested so far this year.” I asked him what he liked best, and he said The Curious Incident in the Nighttime, which was part of our first book club. Somehow the conversation turned to my book club with some colleagues at my last school. I showed him my copy of Station Eleven with the marked and dogeared pages. He asked to borrow it, and we’ve since talked about the multiple story lines and how the author eventually ties them all together. He gives me updates as he’s making sense of this story that is unlike anything he’s read in the past. Jasmine: Currently reading Let the Great World Spin. Jasmine asked me for recommendations for books with multiple story lines. She’d read Extremely Loud and Incredibly Close in our first book club and A Thousand Splendid Suns in our second. I mentioned Colum McCann’s Pulitzer Prize winner, and she noted the ceiling tile that decorates our classroom. Jasmine reads about 120 pages a week and told me in her last conference: “In the next two weeks, I plan to up that number to 200. I also want to find more books with intertwining story lines so I can be motivated to read each week.” Station Eleven is already on her To Be Read Next list. When we talk about rich literature and use passages to teach skills, some students will choose to read the whole text. Doreen: Currently reading The Goldfinch. Doreen is quiet, studious, sometimes even somber. I used a passage from The Goldfinch when I introduced rhetorical analysis. I wrote about it in the post Starting with the Ending. My copy sat in the front of the room under a potted plant until one day it was gone. Doreen had swiped it, and is currently about half way through. When we did a quick whip around the room to share out and rate our current reads today, she rated it a 9 out of 10. I’ll talk to her soon about why Donna Tartt doesn’t get a ten for her Pulitzer Prize winner. Other students are reading just as complex and important books: Nawoon/The Thirteenth Tale, Neydy/The Great Gatsby, Lillian/The Scarlet Letter, Pedro/Dracula. Do I have other students reading YA fiction? Yes, and that is okay because they are reading. Ivan finished Winger by Andrew Smith last week. He told me, holding out the book with tender care: “This is the first time I have made a connection with a book. I get what you mean about literature now.” He is in an 11th grade AP English class! Last summer at UNH Literacy Institute, I wrote a piece that references the reading theory of Louise Rosenblatt extensively. Below is an excerpt. What does it mean to experience literature? First, we must define “literature.” A text can only be considered such if the reader “responds to it in terms of sense and emotion and thought (106). If a book is “to be considered “literature” for any students, it must be experienced” by them (94), and it requires “a particular kind of reading process” (89). All too often teachers of English and those who set the “critical theories dominating the college and university teaching of literature…” simply intensi[fy] the tendency to hurry the student away from any personal aesthetic experience” of it (102). We see this as teachers select the books students will read, usually in whole class settings, assigning reading homework with the expectation that students will read primarily complex literature outside of the classroom. These teachers often give reading quizzes as an assessment of their students’ reading lives, and make the only experience a non-reader has with the text punitive. This is detrimental to the growth of the individual. This is contrary to “our main responsibility” as the educator: “to help the student to find the right book for growth” (67). How are you, the expert in the room, helping students find the right book for growth? It’s interesting that you believe that students’ book choice is best for their growth. I agree that there are some teachers who don’t consider this, making reading not enjoyable for students. When you love and enjoy something, you learn easily and quickly. This is something I personally experienced. When I took a foreign language class, I chose to learn a language that I would enjoy. Despite knowing the benefit of Spanish langauge, I was more interested in sign language. As I expected, I loved ASL and found it easy to learn. I even picked up a few Japanese Sign Language (JSL) outside of school by watching a movie. The same thing could apply to reading by incorporating what we learn in class with the book we love. The joy from reading the right book will educate us more, as well as motivate us to know more. You are on fire lately, Amy. I love all of your words. Thanks for this snapshot of your students and your classroom. It makes me super excited to be moving into an upcoming independent reading challenge! Amy, as adults we rarely read a “whole class book” unless we CHOOSE to participate in a book club or book discussion. Brava for introducing the real world of reading to your students. Ruth, can you imagine? Even when given a whole staff book to read, I tend to cringe. Of course, I’m of the percentage that likes to read, so I usually read whatever I’m given, but I’ve sat in many a faculty meeting when we were supposed be be discussing a whole staff book with colleagues that never cracked the book. No one likes to have choices made for them, readers or non. Thanks for the comment! Amy, thank you SO much for your blog. A colleague shared it with me a few weeks ago and I have looked forward to every update – finding so much that speaks to where I am in my teaching. I teach in a district that is moving toward standards based grading and writers/readers workshop. This excites and overwhelms me. As such, your blog has been invaluable. Thank you for your inspiration! Thank you for your kind words. I’m glad to know you find the topics my friends and I write about helpful. We’ve been on this journey of workshop a while now — and love it — so we are glad to share our learning and insights. Yay for your district moving to workshop. The students, parents, leaders of our world will thank the decision makers for it. Please, ask questions as you have them. Let us know how we can help. Amen, Amy! This is wonderful. Do you do any whole class novels with your AP students in addition to their independent reading? No, Rebekah, I do not read any whole class novels with my students; however, we read, discuss, analyze, evaluate many short pieces together throughout the year. I see the value in reading a core text, and I believe that some texts might lend themselves to functioning as such– like Hamlet in an AP Lit course. But if we want to grow readers, we have to allow as much choice as possible, and then we have to continuously talk to students about their choices. I agree with every syllable of this, Amy. Students will self-select books of ever increasing sophistication with occasional choices that may seem like regressions but are actually just healthy rests. All of this happens at different paces for different readers, a process that is understood beautifully in your classroom. Thank you, Gary. You are a great mentor to me, and I value your feedback. This means a lot.